Customized disaster-resilient homes for Filipinos have now become a possibility, although they won't be available just yet. But a fresh public-private partnership may do the trick. The Department of Science and Technology (DOST) and Revolution Precrafted — a start-up that has grown into a unicorn; that is, reach a valuation of $1 billion — raised this possibility after they agreed to collaborate. Dr. Carlos Primo David, executive director of DOST's Innovation Council, the Philippine Council for Industry, Energy and Emerging Technology Research and Development (PCIEERD) and Robbie Antonio of Revolution signed an accord on Friday, Nov. 3, at the latter's office in Makati City. Revolution, an online platform that sells prefabricated designer, custom homes across the world, connects developers and real estate buyers. It has a stable of at least 30 world-famous architects, artists, and designers such as the likes of David Salle, Tom Dixon, Marcel Wanders, and Zaha Hadid. The prefab homes they design may cost at least $100,000 which the company ships to any part of the world in around 90 days. "We want to learn about what Revolution is doing in terms of disrupting the entire construction industry and the whole housing industry, and we wanted to know if our researchers, whom we brought in today, full force, what we can do, how we can help Revolution," David said. The DOST acknowledged that Revolution driven by its products is already a global brand before its agreement. "DOST wants this global brand to be pure Filipino, not only in terms of concept, in terms of home sets, but also in terms of the materials that are used and R&D that goes with it," David said. He brought researchers from some of the country's top universities, who are specialists in chemistry, physics, material science, construction, electrical engineering, and other fields. Already at the apex of the Philippines startup ecosystem, Revolution, for its part, is looking into the possibility of building affordable disaster resilient customized homes in Tacloban and Marawi. Anku Chibb, Revolution chief marketing officer (CMO), indicated that to build low-cost disaster resilient homes would depend on the success of the DOST research on and development of innovative prefab construction materials. Moving ahead, she said that the start-up is considering launching pop-up hospitals for disaster areas as well as pop-up sari-sari store kiosks, or pop-up kiosks for sidewalk food vendors. Survivors of 2013?s Super Typhoon "Yolanda" (Haiyan) in Tacloban have yet to receive their new homes as promised then by the previous Aquino administration. For its part, the devastated city of Marawi is trying to rise above the ashes after it was held hostage by terrorist groups by more than five months before government ended the siege. So would Revolution consider building for Yolanda victims and the Marawi evacuees whose homes were razed? Antonio replied in the affirmative, indicating that these initiatives fall within the company's future corporate social responsibility projects. 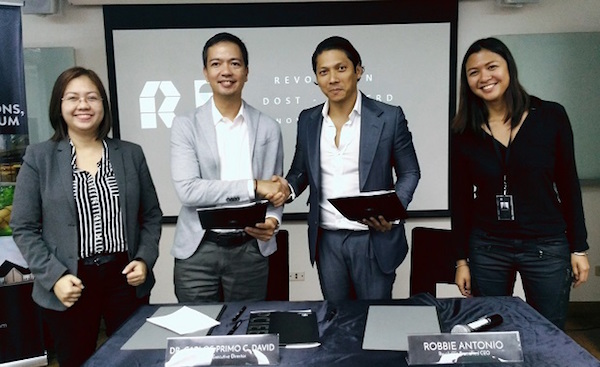 But first, the agreement between DOST and Revolution must be able to succeed in their common goal, to develop construction materials through R&D for building prefab homes that Revolution can use for its business. The agreement binds the DOST into using science and technology (S&T) to discover and develop strong prefab materials Revolution can use. "The goal is to make the Philippines a hub for prefab materials," David said. The sentiment is echoed by Revolution's officials. "Now is the time to showcase Philippine ingenuity through research and development on construction materials on the world stage," they said.